ISSpresso, the world's first zero-gravity espresso machine, launched toward the International Space Station on a SpaceX Dragon cargo ship on April 14, 2015. The International Space Station is about receive perhaps its most important upgrade to date: a microgravity espresso maker! Until now, the crew of the orbiting outpost have been restricted to drinking coffee of the freeze-dried instant variety. But now that the experimental ISSPresso machine has launched to the space station (on Tuesday afternoon by a SpaceX Falcon 9 rocket), the astronauts and cosmonauts will have access to a freshly percolated bag of hot, fresh coffee whenever they feel the urge for a caffeine boost. This is especially good news for NASA astronaut Scott Kelly and cosmonaut Mikhail Kornienko who have just begun their year-long stint on the space station. 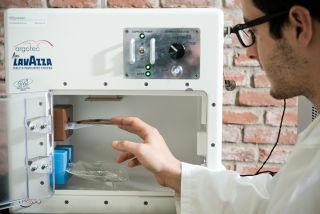 Astronauts using the ISSpresso espresso coffee machine on the International Space Station will test these specially designed cups for coffee drinking in weightlessness. As part of a joint venture between the Italian coffee company Lavazza, the engineering firm Argotec and Italian Space Agency, the ISSPresso was revealed last year. When on board the ISS, the machine just needs to be strapped to the interior wall of a space station module using bungee ropes. Details of how the machine works and the cost of the project are scant as some of the mechanisms are propriety to the companies involved. Lavazzo thinks that the machine will be operating for several years in orbit. Italian astronaut Samantha Cristoforetti will be the first to try out the space station's brand new coffee machine when it gets powered up. The ISSPresso was originally destined to be launched to the space station on board the Orbital Sciences Cygnus resupply vehicle, but an Antares rocket launch explosion in October curtailed Orbital’s access to space and resupply missions had to be transferred to SpaceX. The SpaceX unmanned Dragon capsule launched Tuesday (April 14) at 4:10 p.m. EDT from Cape Canaveral Air Force Station, Fla., where in addition to sending 4,387 lbs. (2,015 kilograms) of food, supplies and the ISSPresso to the outpost, the Falcon 9 first stage made a third attempt at a vertical touchdownon one of the private spaceflight company’s floating landing barges in the Atlantic Ocean.